Melkkos – traditional or with a modern twist? Every mother needs one dish in her repertoire that is fast, nutritious and tastes yummy! My mother’s “old faithful” is a traditional South African recipe, called melkkos. It is also my first food memory. Melkkos was our family’s number one comfort food on cold winter days. Everyone just loves this simple dish that fills you up and tastes like pudding. You’ll see, even the pickiest eater will lap it up! What is melkkos you may ask? Directly translated it means “milk food”. It is a thick milk mixture traditionally served as a light meal or a dessert. Serve it with cinnamon sugar. Then watch the sugar form small syrupy puddles. Melkkos is a bit like milk tart in a liquid form! Yumm!! You’ll find a variety of melkkos recipes, as there are many different ways to make it. Traditionally you rub flour and some butter into crumbs and then cook it in milk, infused with cinnamon. In melksnysels you cook thin strips of homemade dough in the cinnamon flavoured milk. Cape Malay boeber is a thick, spicy milk drink flavoured with cardamom, cinnamon and rosewater. It is thickened with sago, vermicelli or corn flour. Recently, I introduced my kids to this South African favourite! But, I wanted melkkos with a modern twist. So I played around with the traditional flavours of boeber. 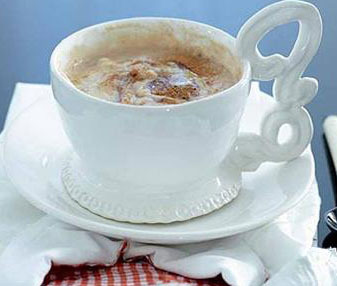 Did you know that Cape Malay boeber is originally from Java, where it was made with coconut milk? Now, I am a big fan of Indonesian flavours. So, in goes the coconut milk. I also add cardamom, vanilla and rosewater. Which flavours do you like the best? Boil 2 cups of the milk and all the coconut milk together with the cardamom pods, cinnamon scrolls and rosewater and let it infuse. Sieve flour, baking powder and salt together. Add the remaining ½ cup of milk to the dry ingredients to form a paste. Add melted butter to the paste. Beat egg yolks and sugar together. Add to the paste. Remove cardamom pods and cinnamon scrolls from milk. Add a bit of the heated milk to the paste. Mix the paste slowly into boiled milk, using a whisk. Cook until done – about 5 minutes and let it cool down a bit. Beat the egg whites and fold into mixture. Mix the following ingredients together. Sprinkle the melkkos with sultanas or toasted flaked almonds and you are guaranteed a comforting dish with loads of flavour!